CANTON, Mass. – After a stretch of 12 Hockomock League titles in 14 seasons, Canton has gone three seasons since its last Davenport crown. The Bulldogs took a step towards reclaiming their spot atop the division standings on Wednesday night at World War II Veterans Memorial Field thanks to strong goaltending and a freshman stepping up in a big moment. In a back-and-forth game with defending league and Div. 2 South champ Foxboro, the Bulldogs finally got on the board with 12 minutes left to tie the score. Four minutes later, Meghan LaBelle popped up at the back post, followed up a sliding save by Warriors goalie Kelli McCarthy (six saves), to scramble home the game-winner. With the 2-1 victory, Canton moves one game ahead of Foxboro in the loss column and four points ahead of the Warriors in the Davenport. The two teams will meet again in the penultimate game of the season. The teams battled through a first half that saw very few scoring opportunities. Foxboro dominated the opening 15 minutes, but the Bulldogs came back and took control in the second part of the first half. It was while the hosts were on the front foot that Foxboro struck. Lily Daly collected the ball on the left edge of the circle, spun to her forehand, and fired a low shot through traffic that snuck inside the far corner. 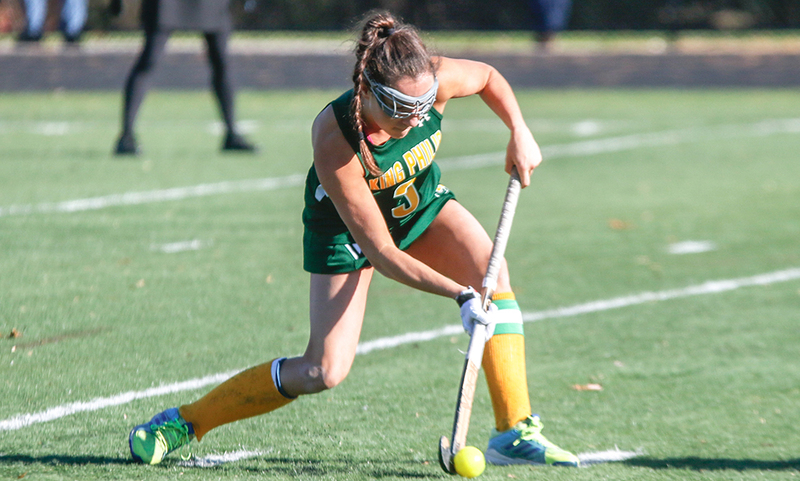 The Bulldogs were spurred into action by going behind and senior forward Andrea McNeil had two chances to equalize before halftime only to be denied by McCarthy, the reigning league MVP. While the first half saw almost no scoring chances for either team, the second half was filled with shots on goal and both goalies were kept busy. 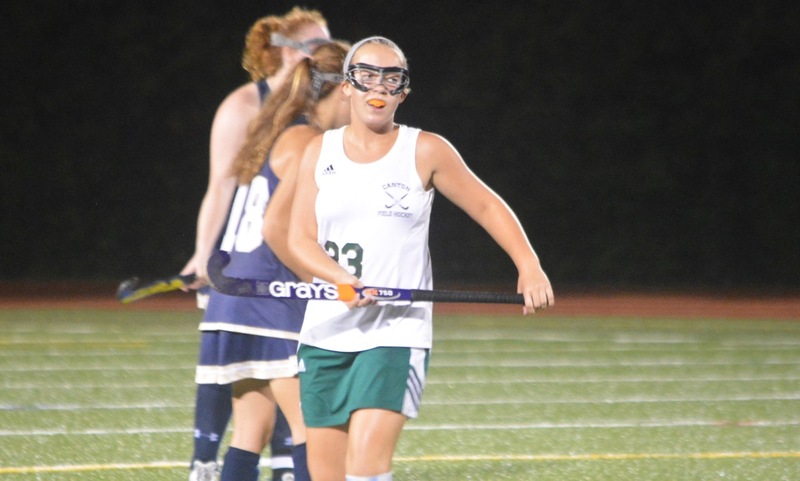 Maggie Malloy had the first chance for the Bulldogs but her backhanded shot went just wide. Foxboro came right back with an intricate corner from Daly to Jackie Brion to Catherine Luciano back to Brion, but the shot went inches wide of the corner past the dive of Canton goalie Riley Brown (nine saves). Daly had a chance for a second but Brown kicked aside her redirect and then blocked the rebound effort by Molly Murphy. Malloy created a chance with a long run to the end line and tried to cut it back for Emily Campbell, but the ball skidded through the crease and out the other side untouched. The Bulldogs had a great move denied by the official’s whistle midway through the second half. Campbell flicked a pass to Katie Trerice, who fired a pass into the middle to McNeil and the ball ended up in the back of the net, but was waived off. Foxboro had the next opportunity, looking to put the game away with 15 minutes remaining. Brown was forced to deny Sophia DiCenso, Murphy, and Luciano in quick succession to keep Canton in it. The Bulldogs nearly capitalized right away but McCarthy slid across goal to block a chance for Molly Cummings. Less than a minute later, with 12:40 on the clock, Canton tied the game. McNeil was on hand at the back post to finish off an inch-perfect cross. Four minutes after tying the game, Canton went in front for the first time. Again, it was a ball played in from the right side, this time off the pads of McCarthy and all the way to the back post where LaBelle was in perfect position to tap it home. The game was hardly over. Foxboro had one more chance to try and steal a point with two minutes to play. Again the Warriors showed off a well-planned corner to work a chance for DiCenso, but the junior’s shot was sent narrowly wide of the post with Brown stranded. At the final whistle, the Canton players charged onto the field to celebrate, knowing that this was an important game against a title rival. “I think seeing that they can take it to the next level with a team that is so successful and has some strong returning players and such a strong goalie,” O’Connor said about the impact of this victory. Canton (6-1, 6-1) will be back on the field on Monday with a trip to Stoughton. Foxboro (5-2-0, 4-2-0) will look to bounce back on Friday when it hosts Mansfield.